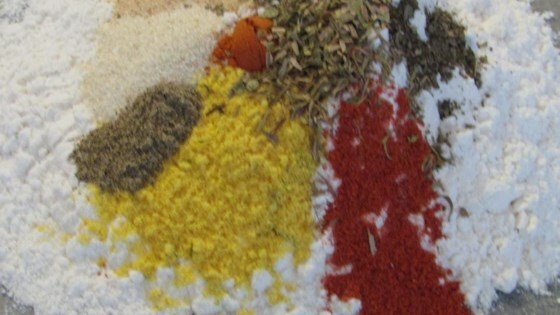 "Great spice mix for flour when cooking chicken." Combine brown sugar, parsley, garlic salt, chicken bouillon, tomato soup mix, cayenne pepper, rosemary, sage, paprika, onion salt, oregano, ginger, marjoram, and black pepper in a blender; pulse until ingredients are pulverized, 3 to 4 minutes. Use 2 tablespoons of the spice mixture per cup of flour when coating chicken. Although it had some flavour, it did not have enough kick to it for me. Itz Awesomez...Made it Twice...A MUST HAV Spice!!!...Thanx!! !